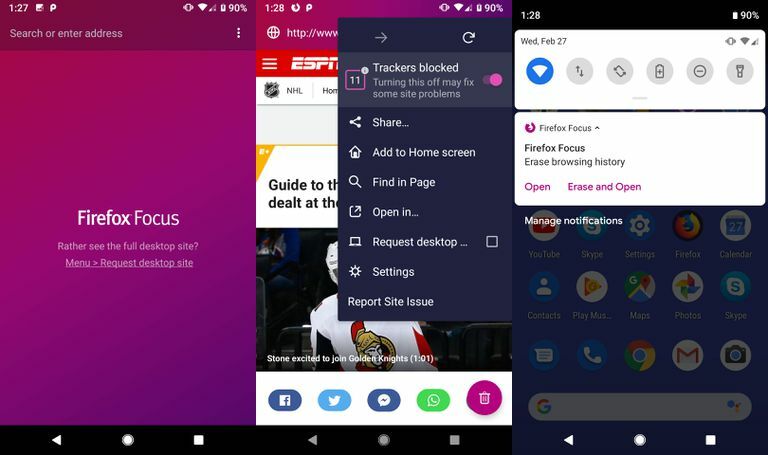 Firefox Focus is a free, lightweight, open-source mobile web browser designed to protect your online privacy and promptly delete your browsing data. Developed by the Mozilla team, the Focus browser simplifies your browsing experience by keeping away distracting and sometimes intrusive web content. By blocking various types of online trackers, as well as eliminating excessive tabs, Firefox Focus separates itself from other popular browsers such as Google Chrome and Safari. Focus' core privacy and security features are the same across Android and iOS platforms, and the same goes for page actions (sharing, copying, finding text), session erasing, and URL autocompletion. Some features, however, are only available on a specific platform. Android's version of Firefox Focus (built with Quantum's GeckoView engine) offers custom tabs, stealth mode, and the option to disable tracking protection (site exceptions). iOS devices have the option to use Firefox Focus as a standalone browser or as a content blocker in Safari, and Siri offers a shortcut. If you own an iPhone X, enable Face or Touch ID to unlock the browser when in the background. This article applies to devices running Android 5.0 and higher, as well as iOS 9 and up. Tap the vertical ellipsis menu in the top right corner, then tap Settings. For iOS devices, tap the gear icon in the upper right corner, then skip to step 4. Tap the switch to the right of the tracking option you wish to enable. Tap one of the options when the dialog box appears. Quickly delete your browsing history with a tap or two. You can also erase your history directly from your device's notification panel. Tap the trashcan icon in the lower right corner. If you have more than one tab open (Android), tap the circular icon in the bottom right corner, then tap Erase browsing history. You can also erase your browsing history from your notification panel when Firefox Focus is running. URL autocomplete is another feature designed to ensure your browsing experience is fluid and hassle-free. There are over 400 popular sites added to the browser's default list, with the option to add your own URLs as well. From the Settings menu, tap Search. Tap the switch to enable/disable autocomplete for Top sites and or Sites You Add, then tap Manage sites to add your own URLs. For iOS users, tap the settings gear, then tap URL Autocomplete under Search. With Firefox Focus set as your default browser, you can open links inside supported applications. The browser functions and blocks trackers, while maintaining the theme and colors of the app you're using. Tap the vertical ellipsis menu in the upper right corner, then tap Settings. Tap the switch to make Firefox Focus your default browser, then enable Switch link in new tab immediately. Inside the app you're using, tap a link. The page will load inside the app but uses Firefox Focus to block trackers. Tap the Vertical ellipse menu to the right of the web address to view how many trackers got blocked. Stealth mode hides the webpage that's visible when in overview mode. If you share your device, you can be sure nobody will see the site you were browsing. From Settings, tap Privacy & Security. Tap the switch next to Stealth. Now when in overview mode, the webpage that was open in Firefox Focus is blank. If you find that specific sites you browse don't function correctly, you can stop Firefox Focus from blocking trackers. Open Firefox Focus, navigate to the website you want to add an exception for, then tap the vertical ellipse menu. Tap the switch under Trackers Blocked to disable tracking protection. This automatically adds the site to your exceptions list. With the vertical ellipse menu expanded, tap Settings. Tap Exceptions to manage your list of sites. If Exceptions is greyed out, you don't have any sites added yet. Scroll down and tap Content Blockers. Tap the Switch for Firefox Focus to enable it. Open Firefox Focus, then tap the settings gear in the upper right corner. Tap the switch for Safari, then close the Firefox Focus app. You're all set to browse privately in Safari. For additional privacy, turn on Face or Touch ID to lock Firefox Focus when switching apps. Under Security, tap the switch next to Use Face ID (or Touch ID) to unlock app.